So I’ve found a new favorite way to eat potatoes! Move over mashed potatoes of my past, I have eaten this greek yogurt potato salad for dinner more times than I can count over the last couple of months. I just make a little batch and then add an avocado on top and call it dinner. It’s been one of my main pregnancy cravings lately. I really have no idea why but it’s pretty healthy and it feels awesome to like food again, so I’m asking zero questions. 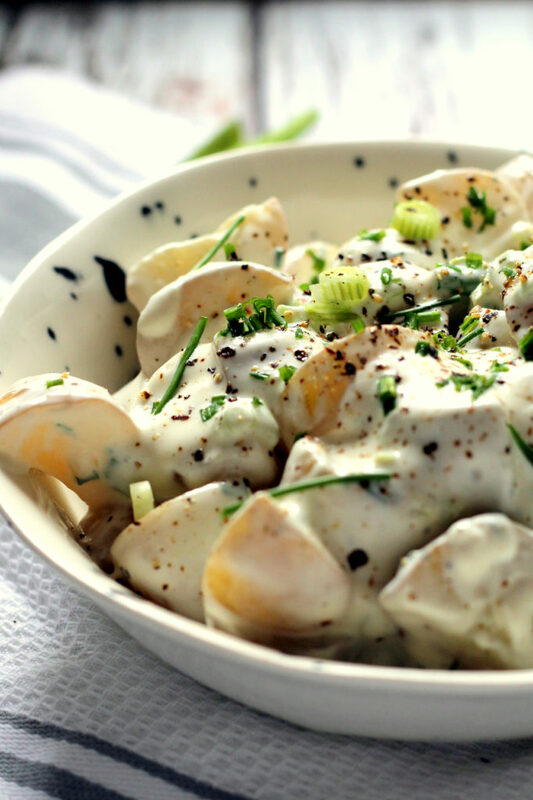 Why use greek yogurt in potato salad? So, mayo based potato salads are all very well, but even as a mayo lover I find this much tastier! And that is while being a little bit healthier. Win/win. It’s more tangy, more moist and more creamy. I do consider this very healthy but it’s not low in fat. I use full fat yogurt and I add olive oil to the yogurt mix which makes the sauce a little richer, and less inclined to just disappear into the potatoes. Otherwise it’s fairly classic – a mix of spring onions and chives, and some dijon mustard and red wine vinegar. 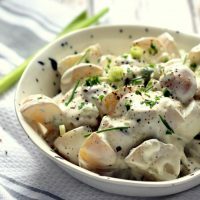 You can of course add some dill – I love it with just the onions and chives because I never really have dill to hand, but it’s certainly a tasty addition. 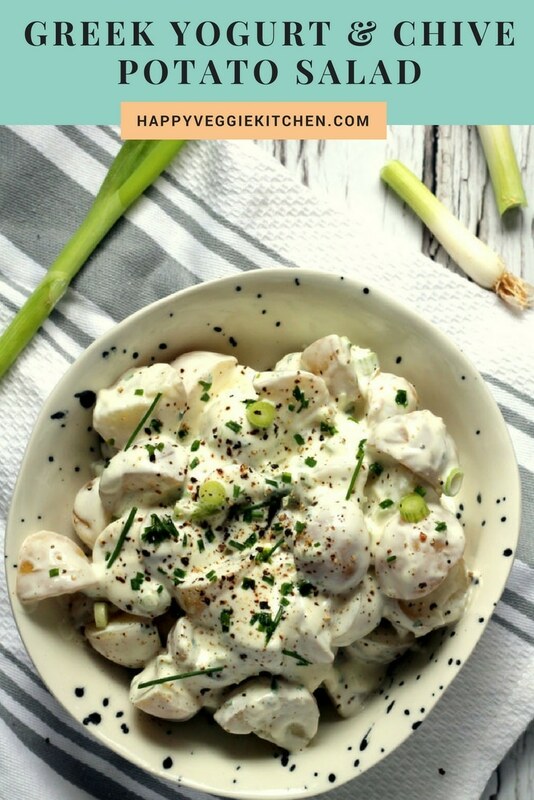 I have actually been making this greek yogurt potato salad in big batches for years when we’ve hosted barbecues, and it always goes down a treat. It is easy to make. Just whisk the sauce together and add to chopped, cooked potatoes. It works well warm or cold – when it’s warm, the sauce goes all melty and luxurious. Irresistible! Looking for Healthy Vegetarian BBQ Dishes? Let me help! I have more! 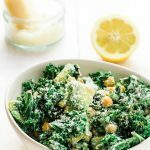 Try my Tricolore Salad with Chickpeas – super filling and sure to be a hit. 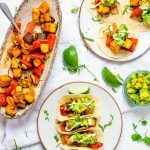 For the main event, forget the veggie burgers and make some Grilled Halloumi Tacos! Another light but carby treat is the Spinach & Artichoke Tortellini Salad. Or this easy, light Feta & Artichoke Dip. 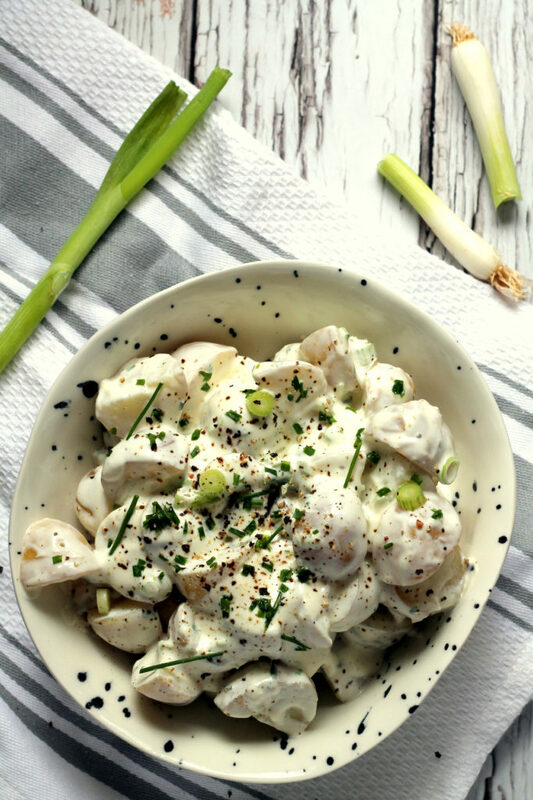 This healthy Greek yogurt potato salad is such a hit at BBQs! 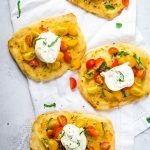 It's easy to make and the silky greek yogurt sauce packs a real punch while being a lighter alternative to mayo. I also love to serve this still warm. To make the dressing, combine all ingredients in a bowl. Cover and place in the refrigerator to let the flavor develop. I'd ideally leave this overnight, but just do what you can. If you are serving this warm, leave the potatoes for about 15 minutes before stirring in the dressing and serving. If you are serving this cold, refrigerate the potatoes until they are completely cool and then combine with the dressing. 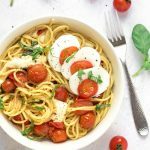 Can I add egg to this salad? Do you mean hard boiled egg? Of course! That would be delicious! Thank you! So happy you enjoyed this! don’t usually like potato salad because I hate mayo, so was very happy to find a recipe that had zero mayo! I had a lot of dill to use up so substituted dill for the chives. I used warm potatoes that had been left to cool for about 15 minutes. 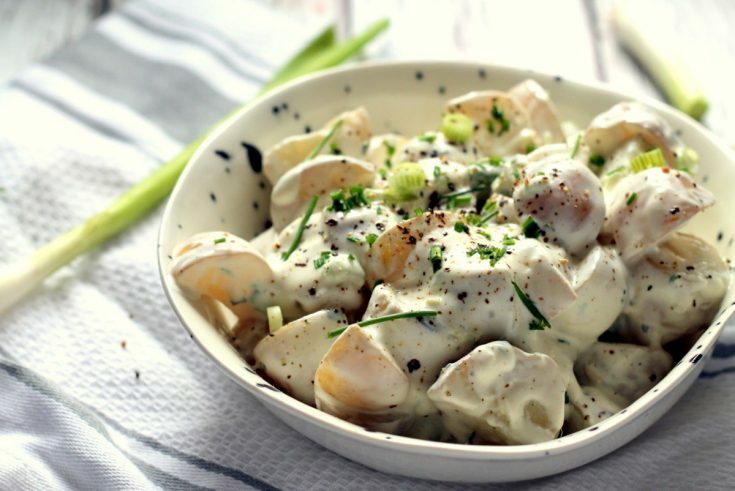 It came out fantastic — really creamy and with just the right amount of flavour from the dill and the spring onions. Yummy, will definitely make again.